New Zealand Bloodstock’s Ready to Run Sale of Two-Year-Olds boasts a proud history. In its 38-year history countless graduates have performed at the highest level on the international stage and with over 100 stakes wins and 17 Group One wins in the last five seasons alone. Graduates in their classic three-year-old season in the last five years have claimed five Guineas and five Derbys at the elite level. Last season it was Mr Clint (Power) who joined the list of Guineas winners when he scored his first stakes win in the S$1 million Listed Singapore Guineas. Purchased by Laurie Laxon for $95,000 out of the 2016 Riversley Park draft, he added to the proud record in the race for graduates of the Sale. Debt Collector (Thorn Park) won the Singapore Guineas two years earlier, and with an additional four stakes wins in his three-year-old campaign he was voted Singapore’s Horse of the Year, Champion 3YO and Miler in 2016. Singapore-based Cliff Brown Racing purchased the gelding for $120,000 out of Prima Park’s draft and has now won more than $2.4 million in prizemoney - 20 times his purchase price. The Windsor Park Stud-based sire Turn Me Loose (Iffraaj) and Mapperley Stud’s late sire Atlante (Fastnet Rock) were winners of the G1 New Zealand Two Thousand Guineas in 2014 and 2013 respectively. 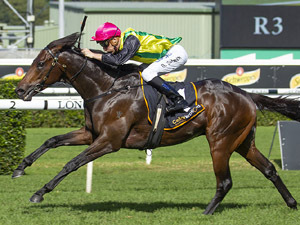 Crowned Champion Sprinter and Middle-Distance Horse in New Zealand, Turn Me Loose was offered by Mana Park and purchased for an affordable $52,500 by Victorian buyer Todd Hartley, while Atlante was presented on account of Lyndhurst Farm where Bruce Perry secured him for $200,000. No better example of the three-year-old dominance to be found at Karaka is the G1 New Zealand Derby – Rosehill Guineas winner Gingernuts (Iffraaj). Purchased from Stanley Park by Te Akau Racing at the Sale for $42,500, he was trained by the team’s then duo Stephen Autridge and Jamie Richards to triumph on both sides of the Tasman. He became one of three New Zealand Derby winners in the last four years sourced at the Sale and amassed $1.3 million in prizemoney – nearly 31 times his purchase price. Vin de Dance (Roc de Cambes) was the headline act last season winning the $1 million Group One New Zealand Derby. From the draft of Ohukia Lodge, he was purchased by Phill Cataldo Bloodstock for $70,000 and joined the stable of Murray Baker and Andrew Forsman. His victory gave the trainers their second New Zealand Derby win following Mongolian Khan’s (Holy Roman Emperor) triumph in 2015, another Ready to Run graduate who was secured by Inner Mongolia Rider Horse Group for $220,000 out of Regal Farm’s draft. The Derby success for Mongolian Khan continued across the Tasman as he proved the best staying three-year-old in Australasia when he conquered the A$2 million Australian Derby. He was New Zealand’s Horse of the Year and Champion Stayer for two consecutive seasons and retired to Windsor Park Stud with $4.3 million in prizemoney – 20 times his purchase price. In 2016, the $90,000 Windsor Park Stud graduate Well Done (Falkirk) made headlines further afield when he won the coveted S$1.15 million Singapore Derby. On November 21 and 22 buyers will have the opportunity to invest in the new wave of talent with 445 two-year-olds catalogued by 110 sires, including leading sires in both New Zealand and Australia. Prima Park’s Lot 199, a colt by Savabeel, is a full brother to Group One Queensland Derby winner Brambles. Diamond Lodge will offer Lot 69, a filly by Savabeel, who is a three-quarter sister to Group One New Zealand Derby winner Helene Vitality. He also placed in the Group One Australian Guineas. Diamond Lodge will also offer Lot 417, a colt by Tavistock, who is a half-brother to Group One New Zealand Derby winner Habibi. Riversley Park’s Lot 91, a colt by Burgundy, is a half-brother to the current Group One Victoria Derby placegetter Sully. Kiltannon Stables have catalogued a colt by Super Easy (Lot 97) who is a half-brother to Singapore’s 2017 Champion Polytrack Horse and Listed Singapore Derby placegetter Nova Strike. Ohukia Lodge’s Lot 435, a colt by Sacred Falls, is a three-quarter brother to Listed Hong Kong Derby Trial winner and Hong Kong Derby placegetter Unique Jewellery. Regal Farm’s Lot 234, a colt by Sweet Orange, is a half-brother to Singapore’s Champion 3YO Miler and Stayer, and Listed Singapore Guineas winner, Onceuponatime. Ohukia Lodge have consigned a gelding by Proisir (Lot 200) who is a half-brother to current NZB Filly of the Year and Group One New Zealand One Thousand Guineas placegetter Dijon Bleu. Phoenix Park will offer Lot 148, a colt by Savabeel, who is three-quarter brother to Group One New Zealand Two Thousand Guineas runner-up Chambord. Kiltannon Stables’ Lot 212, a filly by Ekraar, is a half-sister to Singapore’s current Champion 3YO and Listed Singapore Guineas placegetter Countofmontecristo. Kaipira Lodge will offer Lot 4, a gelding by Duporth, who is a half-brother to European Group One The One Thousand Guineas placegetter Nasheej. Wellfield Lodge’s Lot 110, a gelding by Burgundy, is a half-brother to the Group One New Zealand One Thousand Guineas-placed Sweepstake. Riversley Park Stud have consigned a gelding by Darci Brahma (Lot 256) is out of the Group One New Zealand One Thousand Guineas placegetter Smoulder. Kilgravin Lodge’s Lot 315, a colt by Dissident, is out of a stakes winning mare who has produced five stakes performers. He is a half-brother to Group One Canterbury Guineas placegetter Timbourina. Ohukia Lodge’s Lot 340, a colt by Deep Field, is a half-brother to the Australian Champion 3YO filly and dual Group One winner Faint Perfume. She also placed in the Group One Thousand Guineas.